The Edrington Group have today announced the release of two special limited edition whiskies from their portfolio of distilleries - one from the iconic Speyside distillery of Macallan and the other from its Speyside neighbour, Glenrothes. Here are some brief details about each release. This special release from the Macallan distillery is to commemorate the 250th anniversary of the birth of Robbie Burns, the famous Scottish poet. The whisky is selected from cask number 1759 (the year of Burn's birth) that was discovered in the warehouse. It was thought appropriate that this significant number should determine the whisky for this release. The whisky inside was distilled in 1997 and has been maturing in the sherry cask ever since. 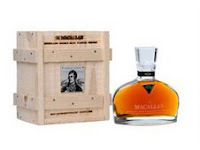 Only 250 bottles are being released at 46% ABV and they will only be available from the Macallan distillery shop for £199 each. Each bottle is presented in a specially designed crystal decanter and an oak casket that is handcrafted in Burns' home town of Alloway in Dumfries & Galloway. This special edition whisky is released to celebrate the work of Edrington's legendary Malt Master John Ramsey, who retires at the end of this month after 18 years of service. 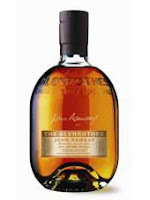 The whisky is created from different ages of Glenrothes vintages ranging from 1973 to 1987, each one selected by Ramsey. There will only be 100 bottles of this unique whisky available at the princely cost of £699. 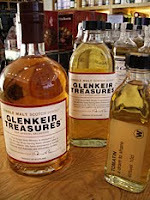 These will be found in very selected whisky retailers and from the Glenrothes website www.theglenrothes.com. Each bottle comes in a hand crafted box with a booklet written by John Ramsey. Within the press release, they included these tasting notes -The appearance and colour is medium golden, clear and bright with a bouquet that is rich and spicy with blood orange and vanilla prominent. The palate is rich and full flavoured with balanced oak and fruit, especially mango. The finish is long, mature and tactile with an unmistakable American oak feel. More information on both of these limited edition whiskies can be found on their respective websites www.themacallan.com and www.theglenrothes.com. Jameson whiskey is one of Ireland's most famous exports and has been the best selling Irish whiskey in the world for over 100 years. The whiskey was first produced by John Jameson in 1780 at the Bow Street distillery in the heart of Dublin. By the early 1800s, the distillery was producing one million gallons (4500 litres) of whiskey per year and had grown to be the largest in the world. The production has now moved to the Midleton distillery and the Bow Street site is currently a museum and visitors centre. Jameson is made following the original 1780 recipe that uses malted barley combined with unmalted barley and other grains. It is distilled three times in copper pot stills to create its famous smoothness and flavour. Jameson sells a staggering 30 million bottles a year around the world, making it by far the biggest selling Irish whiskey. 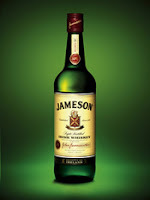 Jameson whiskey is currently made at the Midleton distillery in County Cork in the south of Ireland. It is a modern distillery and was built in 1975 following the amalgamation of three powerhouses of the Irish whiskey industry in the 1960s - the Cork Distillers Company, John Jameson and John Powers. They built the new distillery and it is now the largest in Ireland and one of the largest in Europe with an annual capacity of 19 million litres. Numerous famous names of the Irish whiskey industry are now made at Midleton, all to their original traditional recipes. These include Jameson, Midleton Rare, Paddy, Powers, Redbreast and Tullamore Dew. The new distillery replaced the previous Old Midleton distillery that had been operating since the 1820s and is now a tourist visitor centre. This Jameson Irish Whiskey with its famous green bottle and cream label is the cornerstone of the Jameson core range and whiskey empire. It is golden amber in colour with an aromatic nose. There is some initial sweetness which incorporates vanilla, dried fruits (think of sultanas plus candied orange and lemon peel) and cereal grains. Then comes a savoury/bitter note that is hard to pin down but is most reminiscent of oaky wood. On the palate, this feels thick, rich and a little oily in the mouth with the vanilla, dried fruits and cereals all present again. The citrus peel and zesty notes are particularly prominent and enjoyable. There is also some further sweetness (think of honey) and this is balanced by some bitterness (imagine grain husks and wood) and a distinct spiciness that appears (think of nutmeg and cinnamon). The finish is relatively short with a sweet, creamy beginning (vanilla and citrus zest again) before turning spicy (that nutmeg again) and slightly bitter (imagine husks of grain). Jameson Irish Whiskey is a very good all round whiskey and it is easy to see why so many people enjoy drinking it around the world. It is not the most complex of whiskies but is full of character and is smooth, rich and flavoursome. The whiskey is well made and would be a great suggestion if you want an easy drinking everyday Irish whiskey in your cabinet. This Jameson is widely available. It also offers good value at around £15-18 a bottle and can occasionally be picked up cheaper in supermarket promotions. 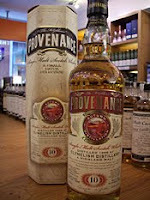 Have just tried ... Clynelish 10 years old 'Provenance' from Douglas Laing & Co.
Clynelish (pronounced kline-leesh) is a distillery that is located in the town of Brora on the north eastern Highland coast. It is a modern distillery that was opened in 1967, however the history goes beyond that date. There has been a distillery in Brora since 1817 and this was also called Clynelish. The current distillery was built next to the old one and they were run simultaneously under the same name until the old one was closed in 1983. Now, any whisky produced at the new distillery is called Clynelish and anything that remains available from the old distillery goes under the name of Brora. The current owners of Clynelish are drinks company Diageo and it is the 4th largest in their portfolio of 28 distilleries, producing 3.3 million litres of whisky per year. The whisky produced at both distilleries has long been well renowned amongst connoisseurs but they are generally unknown to the general consumer. The two main releases are a 14 years old and a limited 'Distiller's Edition' that is part matured in Oloroso sherry casks. Clynelish is readily available through independent bottlers and these offer a great opportunity to buy quality limited release whiskies for a decent price. This bottle is released by the Glasgow based independent bottling company Douglas Laing & Co and forms part of their Provenance range. This 10 years old Clynelish is a luminescent golden yellow and it has a fresh aromatic nose. There is plenty of vanilla and oak present and these are joined by some fresh dried fruits (think of sultanas especially), cereal grains, a hint of some tropical fruit (imagine passion fruit) and just a whiff of peaty smoke. On the palate, this whisky has a zesty freshness (think of lemon zest) and is packed with sweet caramel, vanilla, honey and dried fruits (those sultanas again). This is balanced well by some woody spiciness (imagine nutmeg), that whiff of peaty smoke (think of damp earth and ashy bonfires) and a touch of saltiness (think of sea water). The finish is long yet delicate with vanilla oakiness, the dried fruits and salty tang prominent. This is a lovely whisky that is not as rich, salty or smoky as previous versions of Clynelish that have been sampled. The fresh and sweet notes are complimented and balanced by the savoury elements, resulting in a very enjoyable dram. It is bottled at 46% ABV and is from a single cask, so represents good value at £40-45 a bottle. A very pleasant whisky. This week sees the release of a very special whisky by the Bowmore distillery. Bowmore is located on the famous whisky island of Islay, which lies off the west coast of Scotland. Islay is the home of smoky whisky and Bowmore is one of its biggest names. The distillery is the oldest in operation on Islay and one of the oldest in Scotland, having started production in 1779. It is situated in the village of Bowmore, which translates as 'sea rock' from Gaelic. The current owners are Morrison Bowmore, a division of Japanese drinks company Suntory, and the distillery has a capacity of two million litres per year. The Gold Bowmore is the oldest whisky ever released by the distillery and forms the final part of a unique trilogy that they have created. Each whisky in the trilogy - named Black, White and now Gold - were distilled at the same time in 1964 but then stored in different casks and released in very limited quantities within the last couple of years. 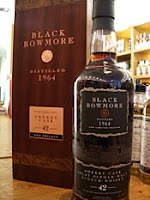 The first was the Black Bowmore which appeared in 2007 at 42 years of age. It had been matured entirely in Oloroso sherry casks and was restricted to just 827 bottles upon its release. As a result of the age and rarity combination the price was approximately £2500 a bottle! 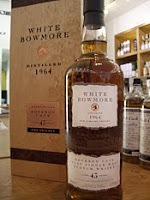 Next in 2008 was the White Bowmore. This was released at 43 years of age having been entirely matured in American bourbon casks. Only 732 bottles were released worldwide and the price around £2750 a bottle. Now, the Gold Bowmore completes the trilogy. It is released at 44 years of age and has been matured in a combination of American bourbon and Oloroso sherry casks. There will only be 701 bottles released with a recommended retail price of approximately £3250 each. As this trilogy of whiskies are extremely rare and expensive, we have not been lucky enough to sample any of them, so we thought we would include Bowmore's own tasting notes. This whisky is ebony in colour with an aromatic nose of exotic fruit, ginger and cinnamon. The palate combines ripe mango, toffee and dark chocolate with the faintest hint of signature Bowmore smoke. This whisky is the colour of golden syrup with an amazing aromatic nose of Galia melon, mango and papaya. On the palate there are mixed exotic fruits, vanilla and maple syrup notes with a trace of Bowmore peat smoke. This new whisky is rich gold in colour with aromas of passion fruit, papaya and vanilla on the nose. The palate explodes with ripe exotic fruits, creamy vanilla and only a hint of Bowmore peat smoke. Royal Mile Whiskies is one of the UK's leading independent whisky and spirits retailers. The company was established in 1991 and has seen it reputation grow and establish a worldwide customer base. They currently have two shops - one on Edinburgh's Royal Mile and one in London's Bloomsbury Street - with a third shop in Edinburgh specialising in cigars. 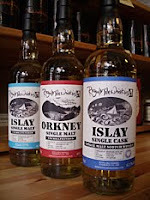 Royal Mile Whiskies have one of the best whisky retail websites on the net and in addition to an expansive range of whisky, whiskey, bourbon and other spirits, the website is home to in depth distillery profiles, whisky history and staff tasting notes. Check it out at www.royalmilewhiskies.com. Royal Mile Whiskies carefully select and bottle their own whiskies from time to time and the latest of these have just been released. Each of the three whiskies are bottled from a single cask and offer excellent value for money as they are all priced under £30 and bottles are limited. They can be purchased from either of their shops or from the website. Below are the details and tasting notes for each of the three new whiskies. Bunnahabhain distillery is located on the north eastern coast of the western Scottish isle of Islay. This whisky was distilled in 1999 and is light and straw like in colour, with a fresh and lively nose. It is full of sweet cereal grains and even sweeter fresh green fruits (think of pears, apples and white grapes). There is also a whiff of saltiness (imagine sea air). On the palate, this is sweet and sugary (think of icing sugar). The sweetness is again coming from the grains and fresh fruit elements but there is also a zingy citrus quality (imagine lemon zest). This combines with the salty note (think of brine) to give a mouthwatering feel. The finish is fresh and reasonably long with just a hint of some earthy smoke coming through. Highland Park is a distillery on the Orkney islands that lie to the north of the Scottish mainland. Distilled in 1997, this whisky is golden in colour with a slight amber hue. The nose feels rich with a combination of caramel, cereal grains, something floral (think of dried heather) and some lovely earthy peat smoke. On the palate, this feels soft and smooth with the caramel particularly prominent (this has a slight burnt sugar quality). There is also some sweet honey, that dried heather again, a citrus note (think of candied orange peel), a hint of saltiness and rounded, light peatiness that has a spicy edge (think of pepper). The finish is medium to long and particularly sweet and earthy. Bowmore is a distillery famous for its smoky style of whisky and is located in the centre of the western Scottish isle of Islay. This whisky was distilled in 1999 and the colour is a pale gold amber. On the nose, there is an immediate smoky hit (think of bonfire smoke) and then some sweet cereal grains, vanilla and caramel notes start to come through. There is also a lot of alcohol spirit that attacks your nostrils as this is bottled at 62.7% ABV, and this calms when water is added. The palate is robust and intense with the elements from the nose being joined by some dried fruits (imagine sultanas) and some spiciness (this appears especially when water is added). The finish is very smoky, long and slightly bitter and woody. It begins sweetly before becoming very dry. So, not wanting to be left behind we set up a Twitter account for Whisky For Everyone. We have been using Twitter to post regular updates about new posts on the blog and new pages when they are uploaded to the website, with the relevant links. Our Twitter name is @whisky4everyone, so look out for us! We have also met numerous interesting people from all facets of the whisky industry and beyond with whom we regularly communicate. So why not join the growing number of people following us? If you do, you will get Whisky For Everyone updates directly to your Twitter inbox and you won't have to remember to look at the blog or website as we will come to you! If you start following us, you will also be able to interact with both of us by telling us news, ideas or info and asking us questions or for recommendations. Earlier this week we were lucky enough to attend the Boutique Bar Show 2009 in London, which is one of the UK's biggest trade shows for spirits. We sampled a number of whiskies at the show - you can read our reviews of these by clicking here - and while we were there we had the chance to try some other quality spirits. We have decided to 'branch out' away from whisky reviewing just this once and review this range of other spirits that we tried. The list looks long we know, but each one was served in a thimble sized sample glass (honest! ... well OK, there were one or two exceptions!). Caorunn (pronounce ka-roon) is a new handcrafted gin that is distilled in small batches at the Balmenach whisky distillery in Scotland. It is a pure grain spirit that is then infused with six of the traditional gin botanicals (angelica root, cassia bark, coriander, juniper berry, lemon and orange peel) and five exclusive Celtic botanicals (bog myrtle, Coul blush apple, dandelion, heather and rowan berry). Caorunn is dry and crisp with an aromatic nose that is floral and citrusy. The palate has some sweetness and is fresh, fruity and spicy. Very good stuff that would make the perfect G&T. Check out their website at www.caorunngin.com. Umeshu is a plum wine that is traditionally made in Japan, but this version made by Isake is different. It is made using plums from the premium plum growing Moissac region in southern France. They are then macerated in grape spirit and matured in French oak casks. The result is a drink that is a vibrant golden colour with a sweet plum and honey aroma. The sample was served to us with ice and was lovely, rich and silky with gorgeous plum flavours. This would be very good on its own or with soda or prosecco as a mixer. Take a look at their cool website for the range of premium sake www.isake.co.uk. This is a premium vodka from the Cape Bjarne distillery in southern Sweden. It is made from 100% new potatoes and is distilled only once so as to preserve the maximum flavour. The vodka is aromatic with a lovely sweetness and earthiness and on the palate feels rich and creamy. Again, the sweetness and earthiness is present. We had it served to us chilled with some ice and freshly ground black pepper and it was absolutely lovely, with the peppery spiciness bringing out the flavours even further. Check out their website www.karlssonsvodka.com. The Laird family have been producing applejack, an American form of apple brandy, at their New Jersey distillery since 1698. The only time that it has been out of production is during the Prohibition period between 1920 and 1933. Applejack is made from premium apples and is blended using 35% apple brandy and 65% neutral spirit. The colour is like apple juice and the aroma is a combination of sweet, crisp apples and carameled sugar. On the palate, the neutral spirit is more evident but the apple sweetness starts to overtake and make the experience more pleasant. The finish has more of the brown sugary caramel and is reminiscent of an apple pie or crumble. Not bad on its own but would be lovely in a cocktail or with a mixer. The Nardini company have been distilling fine grappa since 1779 in the town of Bassano del Grappa in northern Italy. We sampled some of their excellent products and you can view their full range at www.nardinigrappa.com. First on the sample list was the 'Rosso', a soft, sweet and rich aperitif that is reminiscent of drinks like Martini Rosso or Aperol. It is dark red in colour and has a bitter edge and is excellent as it was served to us with some soda and lemon. Next up was the 'Bianca', one of Italy's premium grappas and a multi award winner around the world. It is one of the best grappas we have tried with a balanced sweetness on the palate and aromatic herbal nose. The 'Riserva 15 Anni' (15 years old) was next and is aged in Slovenian oak casks for 15 years. Darker in colour, this is richer, woodier and softer than the 'Bianca' and is strangely like a whisky. Next up was the 'Ruta', which contains a large leaf of the ruta herb. This gives the grappa a green tint and a bitter, astringent flavour that is a bit more of an acquired taste but very pleasant. The 'Ginepro' was our final sample and is a grappa based liqueur that is infused with juniper berries and a secret mix of Italian botanicals. It is sweet, aromatic and reminiscent of a gin, making it ideal for a cocktail. An excellent range of products. Sipsmith was established in 2008 and is the first new distillery to be set up in London for 189 years. Based in west London, they produce handmade small batches (no more than 500 bottles at any one time) of artisan gin and vodka made from English barley and water from one of the springs that is a source of the River Thames. The 'Barley Vodka' has a slightly nutty nose and is smooth and creamy on the palate with a lovely sweet graininess, that nuttiness again and a hint of wood spice. The 'London Dry Gin' is distilled using 10 classic gin botanicals (angelica root, cassia bark, cinnamon, coriander seed, ground almond, juniper berry, lemon peel, liquorice root, orange peel and orris root) and has a floral, zesty nose. On the palate, it is smooth with some spiciness, zesty citrus and juniper. It begins beautifully dry before becoming sweeter. The finish is dry and mouthwatering. Check out the informative website www.sipsmith.com which includes a great working diagram of how they distill their vodka. Van Wees have been distilling gin since 1782 and are the last authentic distillery to be operating in the Dutch city of Amsterdam. They produce a range of gins produced in the Genever style (one of the oldest styles of gin making where they distill maltwine and the fore father of the London gin style). They use a range of traditional botanicals including fruit, flowers, plants, roots and seeds to infuse flavour in to the gin. The 'Zeer Oude Genever' (Very Old Genever) is matured in oak casks for a minimum of a year and is highly aromatic and quite fruity. The palate is rich, smooth and fruity with a hint of peppery spice. The 'Amsterdamsche Oude Genever' is fairly similar to the 'Zeer Oude' but is sweeter on the palate before turning dry and quite herbal on the finish. Eddu is a whisky produced at the Distillerie des Menhirs, which is located close to the town of Pomelin in the Brittany region of north west France. The distillery was founded in 1986 by local businessman Guy Le Lay, with production of whisky and eaux de vie (including a version of the famous Pommeau de Bretagne apple brandy) beginning in 1988. In the whisky production they use only cereals and products grown in Brittany, including buckwheat - a seed used in health products and world cuisine. This makes Eddu the only whisky in the world to contain buckwheat and its name comes from the word for buckwheat in the local Breton language. The first Eddu whisky was released in September 2002 and the current range consists of three whiskies that are each made using different traditional Breton recipes. This 'Grey Rock' (La Roche Grise in French) is made using 30% buckwheat combined with barley and maize and is a blend of differing ages. The other two are named as 'Silver' (l'Argent) and 'Gold' (l'Or), with the 'Silver' being of particular interest as it is made from 100% buckwheat. The colour of this Eddu 'Grey Rock' is light and golden. The nose is youthful and robust with an initial blast of alcoholic spirit. This is not the best beginning but the nose settles down to reveal some vanilla, fresh green crisp fruits (think of pears and apple) and sweet cereal grains (imagine fresh wheat especially). On the palate, there is a similar story with a hit of burning spirit that then mellows to allow some particularly sweet, sugary notes to come through. This is almost a touch overpowering. The vanilla, fruit and cereal notes from the nose are present and joined by some honey and something sweet and tangy (the closest thing we could think of is sherbet). The finish is long and sugary with an interesting bitterness that appears towards the end. This feels a bit nutty or like husks of grain and creates a better balance to the whisky. This is certainly interesting stuff. There are numerous interesting elements but it lacks any real balance and seems too young. It is hard work to drink straight and may be better with a mixer or in a cocktail but shows potential. It will be interesting to try some older versions of Eddu and see if there is more balance, subtlety and less exaggeration of the characteristics. Eddu has only a small distribution in the UK and can be found mainly through Royal Mile Whiskies for £35 a bottle. We attended The Boutique Bar Show 2009 in London the other day and in between sampling lots of quality whisky and other spirits, we found out a couple of interesting pieces of whisky news. We have not seen these interesting bits of news anywhere, so thought that we would share them. The lady promoting Black Bottle, the popular smoky blended whisky, told us that they have some whisky from the new Kilchoman distillery maturing in a warehouse and that it is to be included in the blend from next year onwards. Black Bottle has the claim of 'including whisky from each of Islay's distilleries', so as from next year this will again be true. She also confirmed that Lagavulin is to remain in the blend, despite some industry rumours to the contrary. The Boutique Bar Show in London's Royal Horticultural Halls is one of the UK's biggest shows for the spirits industry. The two day show is now in its third year and boasts a fine collection of products, including new releases, aimed at both the on and off trades. Whisky For Everyone was in attendance for the first day of proceedings and sampled a number of whiskies that we had not tried before. The list below looks long we know, but it has to be pointed out that each one was served in a thimble sized sample glass (honest!). We are also writing another post highlighting some of the other quality spirits that we tried during the day and this will be available shortly. 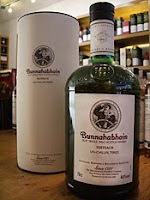 This is the oldest release from the core range of the non smoky Islay distillery of Bunnahabhain. The colour is dark and golden and the nose is rich with a mix of caramel, nuts (think of almonds) and dried sherry fruits (imagine sultanas and raisins). On the palate, these are replicated and are joined by some spices (cinnamon and nutmeg), a slightly bitter woodiness and a distinct salty tang (think of sea water). The sweetness is counteracted by this bitterness and saltiness. The finish is soft and slightly dry, being of reasonable length with the dried fruit and spices prominent. Very nice and a rare treat to try something of this age at such a show. This 18 years of version of the famous blend contains over 20 different single malts from all over Scotland. The colour is a dark amber and the nose is rich and sweet with elements of dried fruit (imagine raisins and candied orange peel), butterscotch and just a whiff of chocolate (think of cocoa powder). The palate is rich and creamy with the fruitiness and butterscotch predominant and some woody spice (imagine cinnamon) and honey coming through. The finish is long and fruity with maybe just a hint of peat smokiness appearing at the end. A very pleasant dram. This world famous blended whisky is named after the tea clipper ship 'Cutty Sark'. The brand is one of the biggest selling around the globe, selling a staggering 14 million bottles per year. Cutty Sark was served to us chilled over ice like a bottle of white wine. The colour was light and golden yellow with a lovely nose packed with vanilla and cereal grains. On the palate, it feels richer than the nose suggests and is refreshing, with lots of vanilla and grains again. These are joined by a pleasant woodiness, some sweetness (imagine honey) and some buttery toffee. The finish is light, crisp and uplifting. Enjoyable. The older sibling of the world famous regular bottling of Cutty Sark contains whisky from some of Speyside's most famous distilleries. It is packaged in a black box and is slightly darker in colour with a richer, sweeter nose. There is a pleasant mix of vanilla, woody spice (think of nutmeg), cereal grains and some sweet honey. The palate is rich, sweet and silky with the vanilla and grains prominent and the spiciness and a slight woodiness balancing this. The finish is long, sweet and smooth. A more exaggerated version of the regular Cutty Sark really, that is very good and enjoyable. The 'Nadurra' appears in a number of forms. We have previously tried the lower strength Duty Free bottling, so the comparison with this cask strength (57.7% ABV) UK market version was interesting. The colour is golden and the nose has a mixture of vanilla, some toasted nuts (think of hazelnuts) and some wood spices (think of nutmeg and cinnamon). On the palate, this Nadurra is quite dry and full of vanilla oak, yet powerful and complex. The elements from the nose are present. Upon adding water, the palate becomes a touch sweeter and more floral (imagine honeysuckle). The finish is long, rich and dry yet very refreshing. Very very good stuff. Glenrothes is a Speyside distillery and they use vintages for its single malts rather than a fixed age, as they believe in bottling the whisky when it has reached peak maturity rather than a certain age. This 1991 is golden brown in colour with a nose that combines vanilla, coconut, dried fruits (think of sultanas and candied orange peel) and butterscotch. The palate is sweet and packed with malty cereal grains that combine with those elements stated for the nose. The finish is long, rich, fruity and spicy (imagine nutmeg) with the butterscotch at the forefront. Classic stuff. The younger housemate of the 1994 is a slightly different beast. The colour is similar (golden brown but slightly lighter) but that is where it ends. The nose is uplifting due to a prominent citrus element (think of lemon zest especially, although there is also some orange peel in there) and this combines with some lovely dried fruit (imagine raisins and sultanas) and sweet toffee. On the palate, this feels lighter with that definite zingy citrus present and a balanced combination of toffee, woody spice (think of cinnamon) and cereal grains. The finish is long and fruity with a nice tangy quality. A lovely dram. Longmorn is a Speyside distillery that is situated close to the town of Elgin. This 16 years old is golden yellow in colour with a classical bourbon cask matured nose. There is vanilla, coconut, woody oak and a touch of a herbal note (imagine dried grasses). The palate is light and enjoyable, again with a lot of vanilla, some toffee style sweetness, honey and some malty, almost yeasty, cereal grains (think of digestive biscuits). The finish is reasonably long with sweetness being balanced by some spices (think of nutmeg) and the returning grassiness. The Macallan distillery is located in Speyside and is one of Scotland's largest and most famous distilleries. The Fine Oak series combines Macallan's traditional sherry cask maturation with some time in a bourbon cask. The colour is golden with a lovely nose that combines vanilla, dried fruits (think of sultanas), sweet honey and some toasted nuts (imagine almonds). This is warm and sumptuous on the palate with a lovely combination of the elements from the nose, malted cereals, caramel and spice (think of cinnamon with a hint of star anise). The finish is complex and fruity with the vanilla and spices coming through well. A superb, smooth and well balanced whisky. Although Mekhong is marketed as a whiskey in its native Thailand, it is actually made from a secret traditional recipe combining sugar cane, rice and local Thai herbs and spices. It is produced at the Bangyikhan distillery and is being officially launched in the UK for the first time (this version is bottled at 35% ABV rather than the Thai version which is closer to 60%!). The colour is a reddish amber with a nose that is much more reminiscent of a rum. The sugar cane is particularly evident with lots of caramel, spices (think of ginger) and some citrus cutting through (especially lemons). These notes are replicated on the sweet palate that is sugary (think of honey and toffee) and smooth. The finish is long and rounded. It maybe too sweet for some people but would be ideal to use with a mixer or cocktail. Interesting to try. The Whisky For Everyone 'Dram of the Day' - a tough choice but it goes to the Macallan Fine Oak 15 years old. Littlemill is a closed distillery that was located in the Lowlands region of Scotland, situated to the north west of Glasgow between the towns of Clydebank and Dumbarton. Production at the distillery finished in 1992 following its owners going into liquidation and if it had still been in operation today, Littlemill would be Scotland's oldest distillery. It was founded in 1772, three years before the current oldest at Glenturret started production, although records show that an illegal distillery was operating on the site as early as the 1750s. The stocks of Littlemill whisky are in decline, as no new whisky has been produced for over 17 years. It is also unlikely that the distillery will be started as it has been dismantled and most of the buildings demolished. As a result, Littlemill whisky is hard to find and is becoming rarer as time passes. The majority of what is left is owned by the Loch Lomond Distillery Company, who release only this 12 years old, and a number of the independent bottling companies. Buying an independent bottling remains the best way to try a Littlemill whisky as Loch Lomond only sporadically release limited numbers of this 12 years old. The colour of this Littlemill 12 years old is golden yellow with a nose that is aromatic and a touch unusual. On the nose, there is a pleasant sweetness (think of toffee or butterscotch), heaps of cereal grains, a hint of some tropical fruit (maybe mangoes but definitely coconut) and a distinct grassiness (imagine dried grass, straw and hay). On the palate, these characteristics are well replicated and it feels warm, buttery and creamy. It is the cereal grains, sweet toffee and grassiness that are particularly prominent. There is also just a hint of some nuts (think of almonds) and some warm spice, like ginger. Despite its richness, it finishes freshly in the mouth, giving a mixture of that toffee/buttercotch/cereal sweetness, the grassiness (this has more freshness this time, like hay) and just a final whiff of raw spirit. That combination may not sound great on paper but it works really well, with the herbal notes balancing the richer sweet ones. 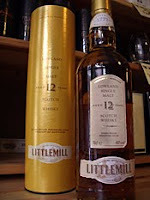 Littlemill 12 years old is a good whisky that is enjoyable, refreshing and uncomplicated. The prominent grassiness and distinct cereal notes may put some people off but it is well worth a try before it runs out. It also represents great value at between £25-30, especially when you consider that it is from a closed distillery and the stocks are dwindling. You will generally only find this in selected specialist whisky retailers. Ardbeg is a distillery on the western Scottish island of Islay (pronounced eye-la). It is located on the south eastern coast of the island and produces some of the peatiest, smokiest whiskies in the world. Islay is the home of the smoky style of whisky and has some of the world's most famous distilleries, such as Laphroaig and Bowmore. Ardbeg was founded in 1815 by John MacDougall, although records show that a distillery was operating on the site since 1794. The current owners are drinks company Moet Hennessey and the distillery has a capacity of approximately one million litres per year. Most of the whisky produced is released as single malt, although Ardbeg also appears through independent bottling companies or in blends, such as Black Bottle. The Corryvreckan is a new expression of Ardbeg that will hit the shelves on 21st September. This follows on a popular limited edition bottling that was released to Ardbeg Committee members in 2008. This new bottling will replace the Airigh Nam Beist in their core range. The whisky takes its name from the famous whirlpool that lies to the north of Islay in a fast flowing channel of water between the islands of Jura and Scarba. The Corryvreckan is the world's third largest natural whirlpool, behind one in Norway and one in Japan. The name is derived from the Gaelic 'Coire Bhreacan' which means 'Breacan's Cauldron'. This relates to the legend of the Norse Prince Breacan, who sailed into the whirlpool for three days to express his undying love for a local princess before being dragged in. He was rescued by the guardian of the whirlpool, the Goddess of winter named Cailleach Bheur, who in turn falls in love with him. For the full story, click on the video clip below to watch the excellent animation produced by Ardbeg to celebrate the original Ardbeg Committee release of Corryvreckan. The colour of Corryvreckan is honey gold and the nose is robust and aromatic yet inviting. There is smokiness and sweetness in abundance (think of earthy peat for the smokiness and sugary caramel for the sweetness). Under these is a distinct grassy note (imagine fresh grass), some dried fruit (think of sultanas and candied orange peel) and a whiff of bitter iodine. On the palate, this is rich and full of character. Again, there is initial powerful smokiness (this is a little more like damp earth or moss now) and a burst of sweetness. The sweetness is more than on the nose but also has a slight bitter edge, like burnt sugar. The dried fruit note (those sultanas and orange zest again) from the nose is present and is joined by a hot spicy element (this is quite peppery and fiery, like a red chilli) and an interesting salty tang. The finish is very very long and full of peaty smoke and the hot, spicy heat. It feels drier than the sweeter nose and palate and is balanced well with a larger dose of the bitter iodine. Corryvreckan is being released at 57.1% ABV, so we then tasted it with some water added. The nose and palate became sweeter (think of brown sugar) with more fresh crisp green fruit (imagine pears and apples). The finish was also sweeter but shorter, with the overall feeling being still very good but less complex and younger. Ardbeg Corryvreckan is a very impressive whisky. You expect quality whiskies to be made by Ardbeg and this one certainly does not disappoint. It will be a welcome addition to the distillery's core range and will without doubt gain Ardbeg further admirers. It will be available in specialist whisky retailers and from Ardbeg's online shop. A bottle should cost £60-65 (or $85-90 in the USA). A special thanks must go to Davinia Small from Ardbeg for supplying our sample of Corryvreckan. An excellent, complex and enjoyable dram. Kilkerran is a single malt whisky that is made at the Glengyle distillery. Glengyle is located in the town of Campbeltown, on the west Highland coast of Scotland. The distillery was originally founded in 1872 by William Mitchell, who was a co-owner with his brother John at the nearby Springbank distillery. He decided to set up on his own but Glengyle history was relatively short and it closed down due to financial difficulties in 1925. It was not to reopen until 2000, when Hedley Smith, the chairman of J&A Mitchell and Co. Ltd - the owners of Springbank, founded the Mitchell's Glengyle Ltd. with the aim of completely refurbishing the derelict buildings and restarting whisky production. The first spirit was distilled in April 2004. This Kilkerran 'Work in Progress' is the first official single malt whisky released by Glengyle. The decision was taken not to name the whisky as Glengyle for two reasons - the first was so as to avoid confusion with a brand of vatted Highland malts that already used the name and the second was that the owners wanted a name to reflect something in the local history. They settled on Kilkerran which is derived from the Gaelic 'Caenn Loch Cille Chiarain' (which translates as 'head of the loch of Saint Kerran'). This was a site that Saint Kerran had travelled to in the Middle Ages and set up a religious group, which is now where the town of Campbeltown is built. The 'Work in Progress' is five years of age and is limited to 12,000 bottles. The colour of this whisky is light and straw-like, with a nose that is highly aromatic and full of youthful vibrancy. There is an interesting mixture of sweet cereal grains, fresh green fruit (think of pears and apples), something powerful and herbal (imagine dried grasses) and just a whiff of some peppery peat smoke. This is a very promising start and on the palate it does not disappoint. It feels creamy in the mouth and the cereal, green fruit and grassy elements from the nose are joined by a sugary sweetness (imagine icing sugar), vanilla and some zesty citrus (think of lemon and orange especially). The finish is long with a hint of earthy smokiness and some woody oak coming through, before it turns slightly harsh and spirity right at the end. 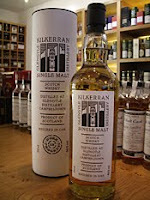 Kilkerran is a very pleasant and highly characteristic whisky. Considering its age, it offers a very interesting alternative to more regular brands and at a decent price (£30-35 at specialist whisky retailers only). It is robust, youthful and vibrant which may not be to everyone's taste, but is showing great potential. It will be interesting to see how this whisky matures over the coming years and they plan to release increased ages of Kilkerran as and when the stocks age increases. This is an excellent foundation upon which to build and is definitely a name to watch out for in the future. Bunnahabhain (pronounced bunna-ha-ven) is located in the northern part of Islay, the famous whisky producing island which lies off the west coast of Scotland. The distillery produces the lightest of the all the Islay single malt whiskies with extremely low levels of peat influence compared to most of the other distilleries on the island, which is famous for it smoky and peaty whisky. Bruichladdich is the only other Islay distillery that produces the majority of its single malt whisky in a non peated style. This Toiteach (meaning 'smoky' in Gaelic and pronounced as toc-chach) is a new limited edition exception to this rule. It is made with heavily peated malt and is bottled at 46% ABV and with no age stated. Bunnahabhain was founded in 1881 and the current owners are Burn Stewart Distillers. The distillery produces 2.5 million litres per year and much of this goes towards the popular Black Bottle blend, which contains whisky from seven of Islay’s eight working distilleries but has Bunnahabhain as its base. The core range of single malts has three whiskies - a 12 years old, this 18 years old and a 25 years old. Bunnahabhain is a favourite amongst the independent bottling companies and through these you can occasionally also pick up some peaty expressions from the distillery. The Toiteach is a light golden colour with a robust, aromatic nose. It is very peaty but the smokiness has an acrid edge that is reminiscent of burning rubber. This becomes earthier the longer the whisky is in the glass. There is also a distinct sweetness (think of caramel) that combines pleasantly with the smoke, although this is tempered by a prickly alcohol burn. On the palate, there is an initial sugary hit (imagine caramel again and honey) and then the acrid peaty smokiness kicks in (still a bit rubbery, like elastic bands). Other elements present include some dried fruits (imagine sultanas especially), some vanilla and malty cereal grains (this note is slightly bitter, like the grain husks), a salty tang (think of sea water or brine) and a warm spicy note (imagine white pepper). However, these struggle against the powerful smokiness. The finish is warming and robust with some noticeable alcohol burn. It starts sweetly with a touch of saltiness before becoming very smoky (a bit more peaty now, rather than rubbery) and pretty dry and woody. The Toiteach is an interesting whisky, as it shows a different side to the traditional whisky from Bunnahabhain. It shows potential but the problems are its youthfulness and the fact that the smokiness tends to overpower almost everything else. The result is slightly unbalanced. It would be interesting to see how this whisky changes with a longer maturation period, where more would be drawn from the cask and the youthful alcohol and smokiness would mellow. An interesting experiment none the less and well worth a try, even if it is just for curiosity's sake. It is available from limited whisky retailers for £45-50 a bottle. 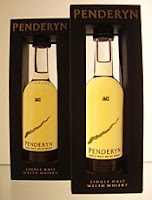 Penderyn (pronounced Pen-derrin) is the only single malt whisky distillery currently operating in Wales. Located in the village of Penderyn in the Brecon Beacons National Park in south Wales, the distillery is one of the youngest in the UK. It is owned by the Welsh Whisky Company, which was formed in 1998 and production began in September 2000. Penderyn is the first distillery to produce single malt whisky in Wales for over 100 years with the last one, Frongoch, closing in the late 19th century. Prince Charles, the Prince of Wales, is one of the distillery's biggest supporters and serves Penderyn whisky at his Highgrove House residence. The production at Penderyn is unique. They buy pre-made wash from a local brewery that is made to their specific recipe and then distil this in to whisky. This is method is illegal in the Scottish whisky industry where the mashing and fermentation must happen on the same site as the distillation, however the water used is taken from a well close to the distillery. Their range is small and consists of a regular bottling (which is around seven years old) and a lightly peated version of the same age. New expressions, including this sherry cask finished whisky, are being added regularly as more stock reaches maturation. The colour of this Penderyn Sherry Wood Finish is golden amber and the nose has an interesting combination of aromas - there is dried fruit (think of sultanas and orange peel), caramel, something spicy (reminding us most of cloves) and herbal grassy note (imagine dried grasses or hay). The nose is very pleasant and makes you want to sit and sniff it for ages. On the palate, there is an initial sugary sweetness and this is reminiscent of crumbly brown sugar and honey. Then a distinct dried fruitiness appears (those sultanas again mixed with dried apple). It is also slightly buttery and coats the inside of your mouth, before finally the herbal grassy note comes through again. The finish is again initially sweet before the grassiness really kicks in and makes the finish quite dry. A damp woody note and a sudden sharp alcoholic burn finishes things off. This Sherry Wood Finish is very pleasant, rounded and smooth. It is very easy to drink and would be a good beginners or introductory whisky. The sherry cask has influenced the whisky well and has added more depth and complexity to the light, fresh and grassy quality of the original Penderyn. The only slight disappointment is the very end of the finish but other than that it is very good, well balanced and enjoyable with some lovely characteristics combining together. It is available at selected whisky retailers and from the distillery shop and should cost £30-35 a bottle. The 'Manager's Choice Single Cask Collection' are a new limited range of whiskies that are being released on four different dates by drinks company Diageo. The idea for the range was that the managers of each of Diageo's 27 whisky distilleries in Scotland were asked to select just one cask from their maturing stock. This cask was to represent the definitive taste of their distillery's product and all are released at cask strength. As each manager has only selected one cask, the number of bottles of each whisky is limited to around 400 - this makes each one very rare and the prices reflect this (all are in the £200-300 bracket). The limited number of bottles also impacts on where Diageo plan to release these whiskies, with them only being made available in the UK, Germany, Switzerland and the Benelux countries. There has been much discussion about the first release of the 'Manager's Choice Single Cask Collection' on blogs, websites and forums, although the majority of information relates to just the age, price and distillery that the whisky comes from. So far no-one seems to have been lucky enough to try any of the first releases, which launched the collection on the 4th September. Information about the second, third and fourth releases is even sketchier and only available on a couple of websites. Here, we have waited slightly and tried to gather as much information as we can about the 'Manager's Choice' series. For the first release, we have included the recommended retail price (RRP), the predominant cask that the whisky has been matured in, the alcoholic strength (ABV) and Diageo's brief tasting notes for each. These appear in brackets next to each whisky. For the second, third and fourth releases, we have only been able to find the RRP to date, but plan to add more information when we can. The final and 27th whisky is rumoured to be from Diageo's new Roseisle distillery and the release date for this has yet to be announced, as the whisky is still maturing to reach the legal age of three years. If true, this will be the first ever bottling of a single malt whisky from Roseisle. Having said that, Diageo also own Dufftown distillery and this does not appear on the list as yet, so the final whisky may be coming from there! 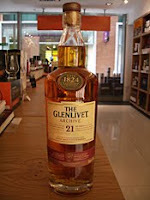 Glenlivet is one of the most famous names and brands in the world of whisky. It is located in the Speyside region, close to the town of Ballindalloch in the scenic Livet Glen, and is one of Scotland's largest with an annual production of nearly 6 million litres. The distillery is currently owned by drinks giant Pernod Ricard and their influence, since taking over in 2001, has seen Glenlivet become one of the best selling single malts in the world. It is second for overall world sales (behind Glenfiddich), third in the UK (behind Glenfiddich and Glenmorangie) and the best selling single malt in the USA. The sales continue to grow, especially in expanding markets such as south east Asia. Glenlivet was founded in 1824 by George Smith, whose signature still appears on the labels and packaging, in old farm buildings and it takes its water from the nearby River Livet. The award winning visitor centre at the distillery is one of the most visited in Scotland. A small percentage of whisky produced at Glenlivet is used in Pernod Ricard's popular Chivas Regal range of blended whiskies but most is reserved for release as single malt. The range of single malt whisky is extensive, including 12, 15, 18, this 21 and 25 years old plus older releases and different cask finishes, as well as exclusive bottlings for the duty free travel retail sector. The colour of this Glenlivet 21 years old 'Archive' is a dark reddish amber. The nose has a rich, sweet aroma that has plenty of malted cereal grains, dried fruits (think of sultanas, raisins and candied orange peel) and spiciness (imagine cinnamon). There is also a touch of herbal grassiness (think of dried grasses) and a distinct characteristic that is difficult to pinpoint, but can be best compared to a waxy furniture polish. The palate is rich, sweet and creamy. First comes a hit of sugary dried fruits (the sultanas and orange peel again) and malty grains and this is followed by a nuttiness (think of a creamy style of nut like almonds or hazelnuts) and more woody spices (imagine cinnamon again, but slightly more than the nose suggested). There is also some honey and oak elements. The addition of water brings out the orange zestiness especially. The finish is long, rich and sweet at the beginning before turning drier and particularly woody and spicy (that cinnamon again - it just won't go away!). This is a great dram that is smooth and creamy yet rich and extremely complex. It is definitely a whisky to sit back, sip and enjoy. The 'Archive' demonstrates how older whisky can be sympathetically matured in sherry casks without the sherry influence taking over the original spirit. It also offers reasonable value with a bottle costing £70-80, depending on where you find it. A top quality product. Tomatin is a distillery located between Inverness and Aviemore in the Scottish Highlands. It is a large distillery that produces five million litres of whisky per year, but despite this remains one of Scotland's lesser known distilleries. This is due to the fact that around 80% of the whisky produced at Tomatin is used in a variety of blended whiskies including the Antiquary and Talisman ranges. The single malt range has been increased by the current owners, the Japanese owned Murubeni Group, and currently includes 12, 18, 25, 30 and 40 years old whiskies. Tomatin was the first Scottish whisky distillery to be owned by a Japanese company, when the Takara Shuzo Corporation saved it from liquidation in the mid 1980s. The Glenkeir Treasures are a range of whiskies that are exclusive to and independently bottled by The Whisky Shop, the UK's biggest whisky retail chain. The Whisky Shop has 14 stores located in England and Scotland and this range is available in each shop or from the website www.whiskyshop.com. The whiskies have been specially selected and purchased, then temporarily stored in wooden casks in each store and filled by the staff instore into 50cl, 20cl and 10cl bottles, as shown in the image above. The whiskies are selected from a variety of distilleries and cover a spectrum of different flavours. This expression of Tomatin has recently joined the range and is bottled at 40% ABV. The colour of this Tomatin is golden yellow and the nose is vibrant and fresh. There is lots of vanilla, caramel and fresh crisp green fruit present (think of pears and apples), as well as a hint of dried fruit (imagine sultanas especially) and some nuts (think of almonds). On the palate, this whisky is feels light and fresh with an initial sugary note that is reminiscent of caramel or burnt sugar. This is followed up a pleasant, crisp maltiness (think of barley grains), vanilla (this seems more exaggerated than on the nose and reminded us of vanilla essence or custard, rather than natural vanilla), nuts and the interesting combination of dried and crisp green fruit that was present on the nose. The sultana note is particularly pronounced. There is maybe just the tiniest hint of some peaty smoke also. The finish is short and sweet with the crisp maltiness, vanilla and dried fruit being the main features. This Tomatin is quite basic in its structure but is a very pleasant and easy drinking dram that is refreshing and would be good for a whisky beginner. It offers great value, giving you the opportunity to try a whisky from a lesser known distillery at an affordable price, while being of good quality. It is sold in three sizes - 10cl, 20cl and 50cl - and these are priced at £8, £13 and £26 respectively, exclusively from The Whisky Shop chain of stores or www.whiskyshop.com.